This little ground hugger (3-4”) is always sought after and enjoyed by gardeners despite its aggressiveness. 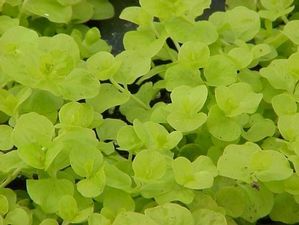 The species has small round green leaves with root nodes between that account for Creeping Jenny’s ability to fill in around steps, rocks, or pathways. Equally gracious spilling over a container or window box, it has fragrant little yellow flowers in May.